This Atlantic Beach hotel is 3.2 km from Atlantic Beach city centre and 6.4 km from Fort Macon Coast Guard Station. Guests will have access to a seasonal outdoor pool and on-site fitness centre throughout their stay. 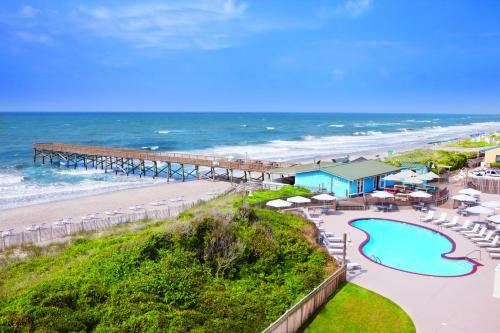 Stay at the DoubleTree by Hilton Hotel Atlantic Beach Oceanfront hotel in North Carolina and experience a tranquil coastal setting, modern amenities and a warm welcome. We will even greet you with our delicious fresh-baked cookie upon arrival. Nestled on a quiet stretch of Atlantic Beach between Havelock and Emerald Isle, the hotel is only two miles from the town center and a short drive from New Bern Airport, Jacksonville, Raleigh and Newport. Every spacious guest room features a balcony and fabulous ocean views. Enjoy modern amenities including an HDTV, a spacious work area and complimentary WiFi. Upgrade to an elegant suite for a spacious separate lounge.